Although I know these probably aren't the most interesting posts on the blog, I love to do little outfit reviews at the end of each month. 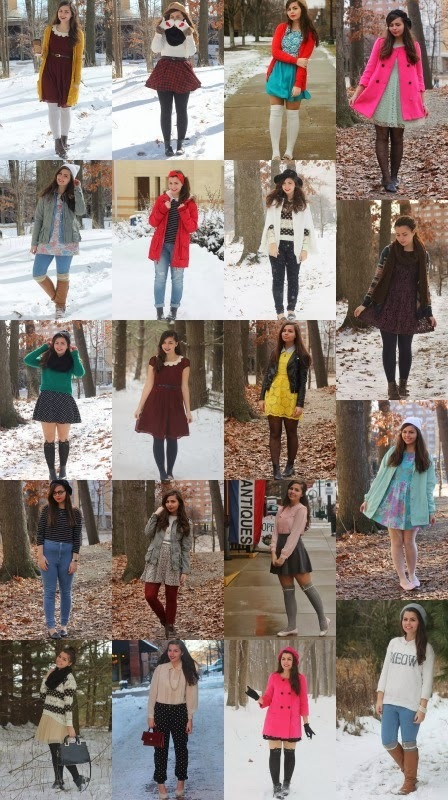 February is edging along quite nicely for me, so it's about time I got up all of my January outfits! January was a hard month and it felt very...long. Very, very long indeed. Temperatures reached the coldest I've ever been through, but somehow I still managed to take the most outfit photos of any month ever? 19?! I sacrificed through the cold days but did wear a lot of pants-- also the most I've ever worn in a month on the blog, 6 different times. It didn't really make me happy to wear pants so often, but I came to not mind them as much after sporting them throughout January. It was my goal many times in 2013 to wear more pants and it never really happened...so all it took was some super below 0 weather to get me to my goal, ha! Least favorite outfit: Last Minute Lauren. Oh how I love that beautiful pink coat! It's so pretty! I was so happy today-I thrifted a gorgeous swing coat in black with red piping- it was 2 sizes too big but it's perfect size wise and so nice and different from anyone else's coat!